How did you first hear about Google? Someone probably recommended it to you. Why are restaurants often fully booked? Mostly because of recommendations. John Jantsch shows how to build a recommendation process for your business. The key to one is content, context, connection and community. Be recommendable: Firstly, you have to be recommendable, i.e. your service has to be outstanding. One example was a kitchen remodeler who always cleaned up the space after a workday. This is simple, but not standard. Create great and useful (contextual) content: Even if you don’t work online this is a great strategy. Let’s take a kitchen remodeler again, he could probably gave each customer a short booklet with tips for how to buy great kitchen equipment. Or just simple instructions for how to clean the surface. Most customers would be happy to see that you care for them. Don’t disconnect: Yeah, it’s great to hit one deal, but make it two or three. Try to connect with your customer. Send them thank you notes (handwritten! ), send them some useful information or send them a gift. How about three high quality wooden spoons? Work with a community: The last part is to connect your business to customers and other businesses. Invite your best customers to a dinner so they can create relationships and you can get useful advice from them. 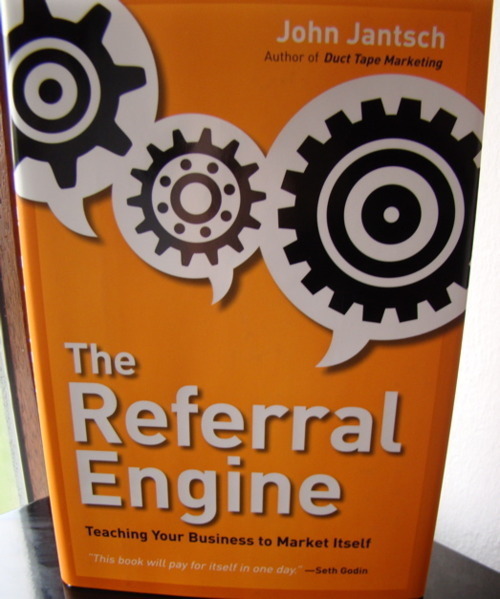 Furthermore, try to find businesses that can help you generate more referrals. The kitchen remodeler could build a network with a bath remodeler. Both get more referrals and can help their customers to get high quality work. Don’t build a network with everybody. Select them thoughtfully! My recommendation is to read this book. Firstly, it is very well written, the format is great and each chapter has a short summarization. Secondly, the advice is really great and there is tons of it. I don’t think that there are people who already doing everything recommended in this book. Thirdly, do I really need more reasons? Yes? OK, John Jantsch gives specific advice for a lot of businesses (e.g. lawn services, computer stores or law firms) and he tells you how to implement his recommendations. Extraordinary book!